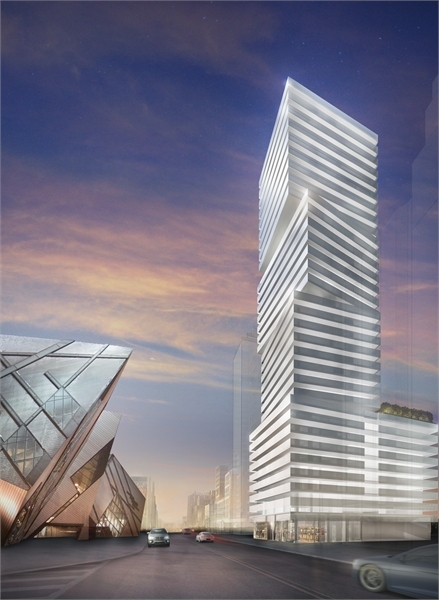 Among the roster of exciting condominiums that grace Toronto’s urban landscape is Exhibit Condominium Residences – an elegant boutique building on Bloor Street at Avenue Road, opposite the Royal Ontario Museum. An architectural masterpiece, Exhibit is already over 90 per cent sold to purchasers who appreciate its prestige and luxury, as well as its location in sought-after Yorkville. Exhibit is designed by Rosario Varacali, one of Toronto’s premier architects as a series of four stacked cubes at varying angles – an exterior that speaks to the dramatic Michael lee-Chin Crystal across the street. Each distinctive cube offers a lifestyle of luxury, with exclusively designed interiors by Diego Burdi of Burdifilek, designers of Holt Renfrew. Revel in sumptuous features and finishes in these suites, which have massive wraparound windows and fritted-glazed balconies. Building amenities will include lounges, a party room, an outdoor rooftop garden oasis with a reflecting pool, fitness gallery and yoga studio. Exhibit is really at centre ice when it comes to spectacular Toronto locations, and offers the most gorgeous views south to the city. Plus, you can stroll into Yorkville in a minute flat, and it’s an easy walk to services, schools, banks, recreational facilities and parks. A limited selection of suites remains. Hurry to become part of this posh, ultra-chic residence. Visit www.plazacorp.com.